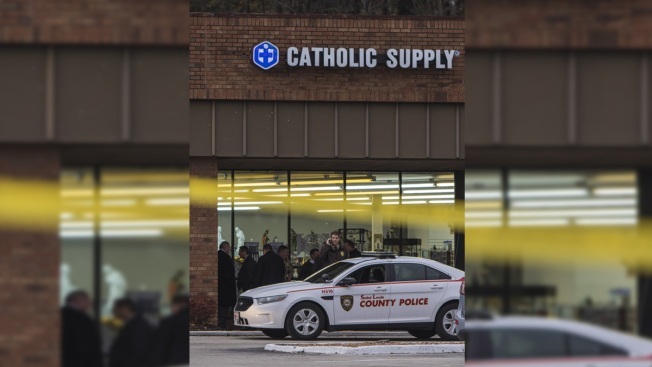 Police investigate at scene where a woman was shot inside the Catholic Supply store in Ballwin, Missouri, Nov. 19, 2018. Authorities say a woman killed inside a religious supply store in suburban St. Louis was a customer. Police on Tuesday identified the victim as 53-year-old Jamie Schmidt of House Springs. An armed man entered the Catholic Supply of St. Louis store near the town of Ballwin Monday afternoon. Police say the man committed a sexual assault before shooting the victim in the head. Authorities declined to say if more than one woman was assaulted. Schmidt died later Monday at a hospital. The gunman remains on the loose and police warn he should be considered armed and dangerous. Police were asking for the public's help in finding the man, described as about 5-foot-7 with a heavy build. He was wearing what's commonly referred to as an Irish hat, or ivy hat.